This sweet and tangy Blueberry Frozen Yogurt with Chocolate Covered Blueberries is brought to you in part by Collective Bias® and its advertiser to help you incorporate "good for you" snacking into your every day routines. As always, the recipe and opinions in this post are my own. Many of us are looking to improve our snacking habits. Well now, DOVE® Fruit has three wonderful dark chocolate covered REAL and WHOLE fruits (cranberries, cherries, and blueberries) that you can incorporate into your every day snacking-- in moderation of course! 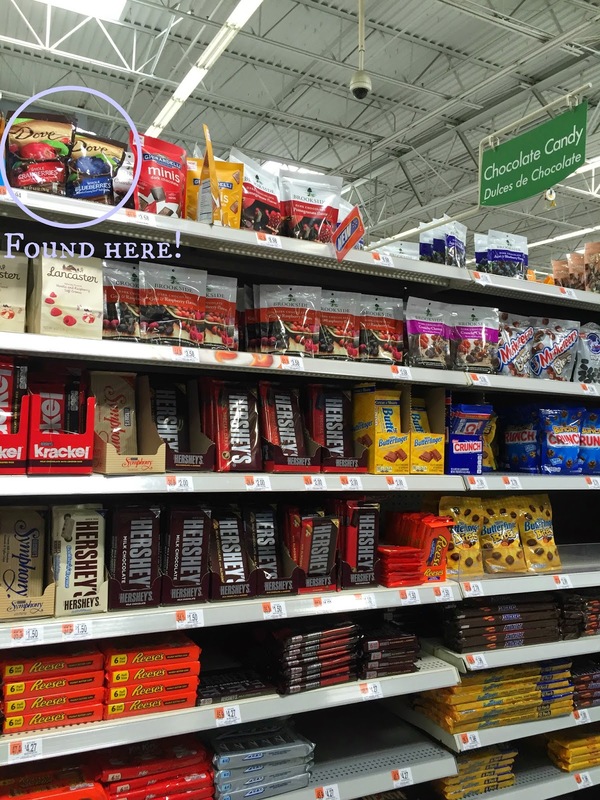 I found these babies in the chocolate candy aisle at Walmart and instead of buying a carton of ice cream, I decided to pick up some ingredients to make frozen yogurt instead which I am sharing with you today. This frozen yogurt is made with fresh or frozen blueberries, plain yogurt, and with honey instead of using sugar. Then for a little more indulgence, I mixed in some chopped chocolate covered blueberries! So instead of buying a carton of ice cream that is loaded with sugar and heavy cream or going to your local frozen yogurt parlor where you load your frozen yogurt with a crazy amount of toppings, this is a homemade version where you control what actually goes into the recipe as well as portion control! This frozen yogurt is sweet and tangy, and you get just a hint of honey flavor. It's also a really fun color for adults and children! 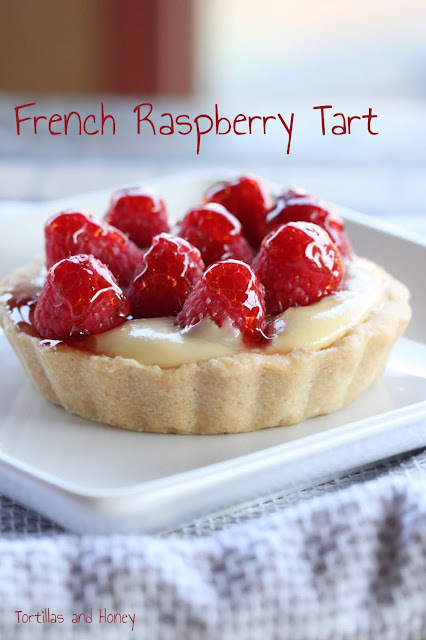 I haven't experimented with this recipe using Greek yogurt, but I might try it next time. I think you can also use this frozen yogurt as a base for other berries, like strawberries and raspberries. 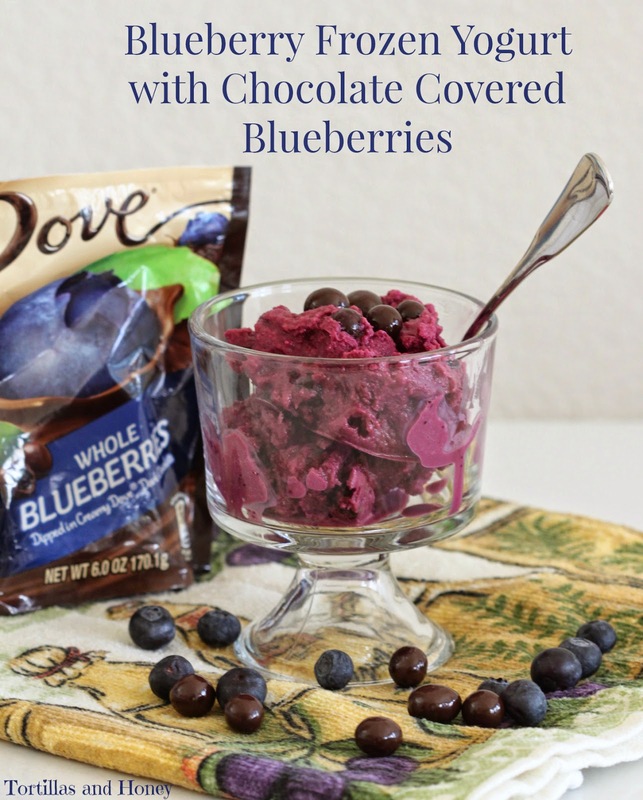 Please visit DOVE® Fruit for more recipe ideas that you can use these chocolate covered fruit! And lastly, I have one extra little gift for you! I have a printable coupon for you so that you can go out an purchase these delightful little snacks! Please click here to download the coupon! What improvements have you make to your snacking habits to make a "better for you" indulgence? A night or two before you make the frozen yogurt, place the base of the ice cream maker in the freezer. Pick through your blueberries and discard any bad berries, stems or debris. Over medium heat, combine the blueberries, honey, lemon zest, juice of half a lemon, and salt in a medium saucepan. Just before the mixture comes to a boil, reduce the heat to a gentle simmer, then cook, stirring occasionally, for 15 minutes. As the blueberries become soft, smash them against the size of the saucepan with a spoon or fork to remove the juice. Mix together your chilled blueberry mixture and chilled yogurt. Add the mixture to the base of your ice cream maker and make the frozen yogurt according to your manufacturer's instructions. About five minutes before the frozen yogurt it done, add in the chopped chocolate covered blueberries. Serve immediately for a soft serve texture, or transfer the frozen yogurt to a freezer-safe container and freeze for several hours for a scoopable consistency. When serving, scoop into bowls and top with extra chocolate covered blueberries. Note: The chocolate covered blueberries are chopped so that they don't become too hard in the frozen yogurt. And you don't get the feeling like you're eating a big rock. When serving, you can top the frozen yogurt with whole chocolate covered blueberries and they will be fine. This yogurt looks scrumptious! I've never tried the fruit snacks, but you've piqued my interest with this treat! this blueberry yogurt is really looking yummy. will definitely try it out.